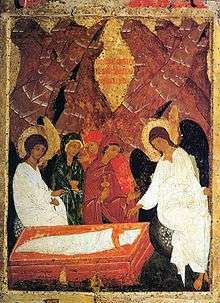 Myrrhbearers on Christ's Grave, c 1235 AD, Mileševa monastery in Serbia. 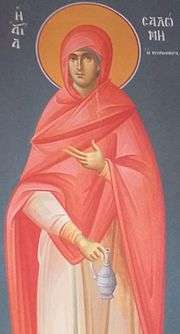 Hagiography, fresco, of Saint Salome the Myrrhbearer in Greek Orthodox Church. In Orthodox Christian tradition the Myrrhbearers (Greek: Μυροφόροι, Latin: Myrophorae; Slavonic: Жены́-мѷроно́сицы; Romanian: mironosiţe) are the individuals mentioned in the New Testament who were directly involved in the burial or who discovered the empty tomb following the resurrection of Jesus. The term traditionally refers to the women with myrrh who came to the tomb of Christ early in the morning to find it empty. In Western Christianity, the two women at the tomb, Three Marys or other variants are the terms normally used. Also included are Joseph of Arimathea and Nicodemus, who took the body of Jesus down from the cross, embalmed it with myrrh and aloes, wrapped it in clean linen, and placed it in a new tomb. (Matthew 27:55-61, Matthew 28:1-10, Mark 15:40-16:11, Luke 23:50-24:10, John 19:38-20:18). In the Eastern Orthodox and Greek Catholic churches, the Third Sunday of Pascha (i.e. the second Sunday after Easter) is called the 'Sunday of the Myrrhbearers'. The Scripture readings appointed for the services on this day emphasize the role of these individuals in the Death and Resurrection of Jesus: Matins Gospel—Mark 16:9-20, Divine Liturgy Epistle—Acts 6:1-7 and Gospel—Mark 15:43-16:8. In the Gospels, especially the synoptics, women play a central role as eyewitness at Jesus' death, entombment, and in the discovery of the empty tomb. All three synoptics repeatedly make women the subject of verbs of seeing, clearly presenting them as eyewitnesses. All three Synoptics name two or three women on each occasion in the passion-resurrection narratives where they are cited as eyewitnesses: the Torah's required two or three witnesses[Deuteronomy 19:15] in a statute that had exerted influence beyond legal courts and into situations in everyday life where accurate evidence was needed. 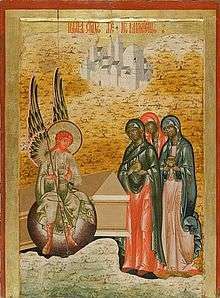 Among the named women (and some are left anonymous), Mary Magdalene is present in all four Gospel accounts, and Mary the mother of James is present in all three synoptics; however, variations exist in the lists of each Gospel concerning the women present at the death, entombment, and discovery. For example, Mark names three women at the cross and the same three who go to the tomb, but only two are observed to be witnesses at the burial. Based on this, and similar examples in Matthew and Luke, Richard Bauckham argued that the evangelists showed "scrupulous care" and "were careful to name precisely the women who were known to them as witnesses to these crucial events" since there would be no other reason, besides interest in historical accuracy, not to simply use the same set of characters from one scene to another. Mark's account (which in the earliest extant manuscripts) ends abruptly and claims that the women told no one. The Gospels of Matthew and Mark do not present any further involvement at the tomb. Luke describes Peter as running to the tomb to check for himself, and John adds that the Beloved Disciple did so too, the beloved disciple outrunning Peter. Wikimedia Commons has media related to Women at the grave. ↑ Richard Bauckham, Jesus and the Eyewitnesses (Eerdmans Publishing Company: Cambridge, 2006), p. 48. ↑ Ben Witherington III, What have they done with Jesus (San Francisco: Harper Collins, 2006), p. 50. ↑ Pliny the Younger, Epistles, X.96. ↑ B. Gerhardsson, “Mark and the Female Witnesses,” in H. Behrens, D. Loding, and M. T. Roth, eds., Dumu-E2-Dub-Ba-A (A. W. Sjöberg FS; Occasional Papers of the Samuel Noah Kramer Fund 11; Philadelphia: The University Museum, 1989), p. 218; Richard Bauckham, Jesus and the Eyewitnesses (Eerdmans Publishing Company: Cambridge, 2006), p. 49. ↑ Richard Bauckham, Jesus and the Eyewitnesses (Eerdmans Publishing Company: Cambridge, 2006), pp. 50–51. ↑ To answer the question of running speed: It is never explained why the disciple(s) move(s) from merely traveling to running, and it has often been speculated that running only occurred on the last stretch once the tomb had come within sight. John Calvin instead speculated that the rush was due to religious zeal. In particular, John describes the Beloved Disciple as outracing Peter, though waiting for Peter to arrive before entering the tomb, with some scholars seeing the out-racing as a metaphoric elevation of the Beloved Disciple above Peter. However, many Christian scholars object to this interpretation, instead arguing that since the Beloved Disciple is usually interpreted as a reference to the author of John, it would be necessary for him to be considerably younger than Peter, and hence his speed could be due simply to youthful vigour. 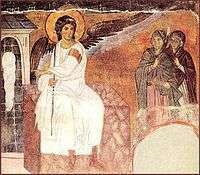 Another question is why John the Beloved Disciple pauses outside the tomb. While many view it as being due to his not wanting to violate death ritual by entering a tomb, in contrast to Peter who has no such qualm and instead enters immediately, most scholars believe John is simply deferring to Peter, particularly since the Beloved Disciple enters the tomb once Peter is inside. There is some scriptural variation as to whom the women told and in what order. ↑ What happens once Mary (and Mary) has seen the occupier(s)/empty tomb is again one of the more variant parts of this narrative. According to Mark, even though the man in the tomb instructs Mary and Mary to inform the disciples ‘‘and’‘ Peter, they flee in fear and do ‘‘not’‘ tell anything to any man. Like Mark, Matthew presents Mary and Mary as being instructed by the tomb's occupant to inform the disciples, but unlike Mark's account they happily do so, and Peter has no special status amongst the others. Luke, again, merely presents Mary and Mary as telling the eleven and the rest, but presents them as doing so apparently without being instructed. John's account is quite different: John only describes Mary as informing two people—Peter and the Beloved Disciple, an individual that is usually considered to be a self-reference by the author of the gospel John.